An important essence of being a leader is to listen to the collective voice of his/her people. People, as in the wider context and not those who are closest to you politically. Access to persons who can express the mood of the public without expectation or fear of losing privilege is paramount. President Maithripala Sirisena and Premier Ranil Wickremesinghe seemingly do not have such people at hand. Or deliberately fails to listen if there are such people for reasons of their own.Trust placed upon this duo in 2015 has been betrayed. Never before has a government faltered in such disgraceful fashion to complete simple tasks entrusted to them. No leader can survive by confronting issues at hand with weak knees. President Sirisena does not have the acumen. PM vacillates and is weak kneed. They appear to have personal reasons for not prosecuting the Rajapaksa clan, hold them in awe or are frightened of them. Maybe they are frightened for themselves should the former President or another corrupt or murderous member is shunted to political office. Read below a report carried by Al Jazeera on 06.04.2018. “Former South Korean President Park Geun-hye was sentenced to 24 years in prison by the Seoul Central District Court after she was found guilty of corruption, Al-Jazeera reported today. The former president was found guilty of several corruption charges, abuse of power and coercion in a verdict issued on Friday. She was also fined $16m. Park was acquitted in at least two of the charges, including abuse of power relating to forcing Hyundai automobile company to run ads for the company owned by Choi. In December 2016, South Korean lawmakers overwhelmingly voted to impeach Park, but she refused to resign offering instead an apology while denying any legal wrongdoing. She was charged and detained soon after her dismissal from office. Newspapers, wire services and electronic media have carried ad nauseum the crooked and murderous deeds of the former regime under Mahinda Rajapaksa. Three long years and a bit have elapsed of the Yahapalanaya rule but Rajapaksas roam free. Free to destabilise politically, economically and more. It does not matter to President Sirisena or Ranil. They are “I am alright Jacks” too. Follow JVP leader Anura Kumara Dissanayake‘s speech during the no confidence debate in Parliament on the 4th of April. This can be accessed on You Tube. Please listen to him. Never before have 225 members of Parliament arrogated to themselves the right to plunder, rob, murder, amass such shocking amounts of money, murder, foist racism, murder and God knows what else in the recent history of our Nation. The political suspects, their kith n kin and bag men are known. Do not forget those in the private sector who are equally guilty. They too fix tenders, help the politicians to rob and even advice them on how to launder the ill gotten loot. We can name them. There are Big Boys who have never produced a safety pin who have amassed billions if not millions. Some have used these monies to get into/ buy into legitimate businesses. Their off springs, wives, sisters, brothers et al can be seen in the lobbies of five star hotels flaunting baubles, dripping heavily with gold, swathed in shockingly exorbitant clothes, draped on sofas looking out anxiously to catch the eye of fashion photographers. It does not matter a nowt that the fashion pages are scanned only by their partners in crime. Read Koluu if you doubt this. But this missive is not about the riff-raff. This is a desperate appeal to President Sirisena and PM Wickremesinghe. We do not know why you interfere in the legal processes of Sri Lanka. But since you do, here’s a plea from your subjects including the upright, honest Policemen and Armed Services personnel. Put the RAJAPAKSAS and the other corrupt POLITICIANS in jail. We are certain that you know who the corrupt are.That was the mandate bestowed upon you in 2015. Do not behave as if you are yet in the opposition. We have descended willingly into a quagmire of corruption, hate, racism, profligacy and artful dodging. You can bulldoze and destroy an edifice in a trice which took years or decades to build. You politicians are guilty of being the bulldozer. The people too have over time followed you. Corruption is now endemic. Racism was not created by the illiterate. It has always been sparked by the educated extremist or politician. The illiterate and the desperate will follow and turn to violence. And in Sri Lanka a section of the Buddhist Clergy has been in the forefront of such violence. The Police will not touch them. They are aware that behind the robed violence is a politician. Take them to task too. You will be revered. Time is running out. It’s not running out for you, but for us. The 225 entrusted by us, and sent to parliament are no longer the Honourable so and so’s, as they insist on calling themselves. They are thieves, robbers and some even murderers. High political office is not to have a safe passage nor be remembered in posterity as a former President,f ormer PM or former Minister. It is to carry out tasks honestly, with equity on our behalf and to lay a foundation to the future generation. The laurels will arrive accordingly. 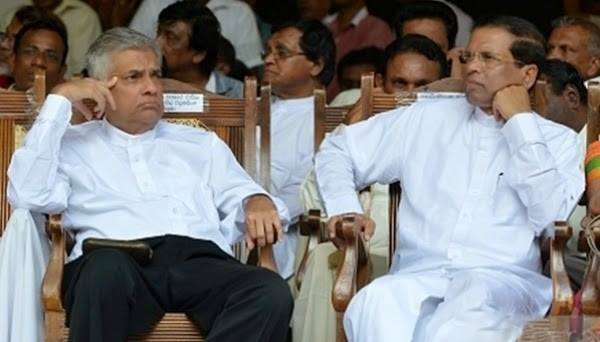 Unless and otherwise the Rajapaksas are taken to task legally and put away neither of you will be able to govern without the sword of Damocles hanging over your head. You of course would only lose political power. The people will lose everything. « Beyond No-Confidence Motion, Is Sanity Possible?